Pretty certain no one missed the run of Ringerdingding at Moonee Valley on the biased track that was dished up on Cox Plate Day. He was one of the few runners to make up significant ground during the entire meeting, and he did so in what was clearly the inferior part of the track. Plenty want to argue that the track that day wasn’t so bad, but seeing is believing. There were a number of runners that loomed up a few horses off the fence, looking certain to run past some of their counterparts closer to the fence, and it was like they hit a strip of quicksand in the straight. Despite City being unbeaten, the Red Devils look every chance to claim victory in the latest instalment of the Manchester Derby. In the NFL, look at the Bears and Jaguars for value. So, it’s no surprise that Ringerdingding has already been well backed in early markets to win this listed event for the three year olds. It was a flashing light run, and although he’s drawn awkwardly here in barrier 12, you’d have to assume they are going to ride him quiet again and save him for the last crack. There should be enough speed on here for the Weir-trained gelding to get every chance to run home over the top of them. 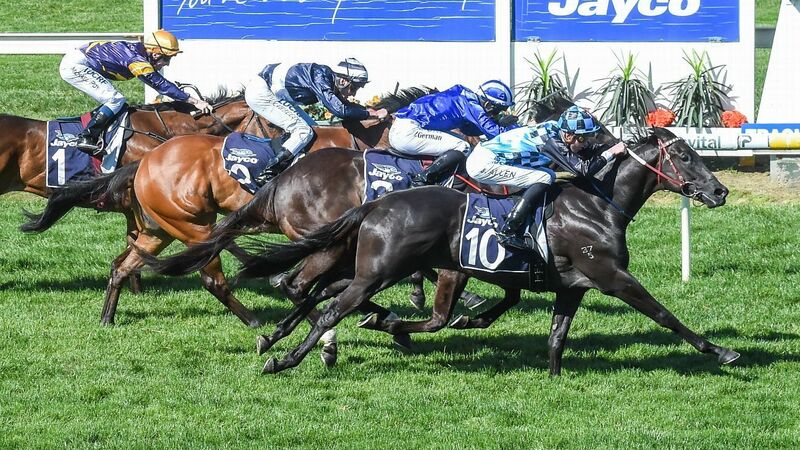 Take out his run on a soft surface at Caulfield and the son of Sebring has been very good since being transferred from Sydney to Victoria’s premier trainer and this looks the perfect race for him to break through. He’s had little go his way in high quality events all Spring, but I think Mr Sneaky can repay the faithful on Saturday and nab a long-overdue victory. He had no luck first-up over an unsuitable trip, was probably looking for further second-up, drew wide in the group one and was forced to race too far back at his next start. He got too far out of his ground from an awkward draw last start and they absolutely walked up front in what was a totally forgivable effort. Nothing has really gone right for him this preparation. On Saturday he draws perfectly and he should get a good surface with no rain predicted in Melbourne in the lead up. This is his perfect trip and he likes the Flemington circuit, so hopefully there’ll be no excuses for Mr Sneaky this time. It really is hard to believe that a horse with Kementari’s ability has won only 25 percent of the races that he’s contested over what is now a 16-start career. It has resulted from a combination of a few factors, but it doesn’t change the fact that he is certainly a galloper with undoubted class. If he can add a second group one to his resume here, a few of the doubters will start to quieten. It’s pretty evident now, as an older horse, that his class on it’s own isn’t going to carry him to victory. He needs to be targeted at the right races, and, although his only major thus far is over a mile in the Randwick Guineas, I think he’s more a 6-7 furlong horse. That will be when we see the best of him as his career moves forward. He should have won first-up in the Missile, little went right for him when fourth to Winx second-up, and he should have won again when beaten a half head in the Memsie. When he was pushed out to a mile in the Makybe Diva, he wasn’t up to the task. They freshened him, lined him up in the Manikato, and his run was sensational when third to Brave Smash. On a night when it was hard to make up ground, he came from near last to be beaten less than a length, and now they keep him at a sprint trip for this. It’s a great field, but I truly believe this is the type of conditions where we’ll see the son of Lonhro truly shine. In high-pressure, weight-for-age sprints, where he can sit off the speed and display that amazing turn of foot he owns. Kenedna raced like a mare that’s looking for further in the Empire Rose last Saturday and she now gets that in the Matriarch Stakes. She also seems extremely well in under the set weights and penalties conditions of the event. Two starts back at Caulfield, she got within half a length of I Am A Star over a mile, in what was her third run back from a spell after almost a year off. It showed she was getting somewhere back to near her peak form and fitness. She got a long way back last week and, although by no means was she horrible the last part of the race, she couldn’t sprint against the best mares. It was evident that she now needs at least a mile and a quarter, and arguably a slight drop back in grade. From a good draw, the four-time stakes winner as a three-year-old, can perhaps settle a touch closer. If she gets the splits at the right time, she’s good enough to be right in the thick of this, at very backable odds.